Gathering online reviews hasn't always been a priority for healthcare providers and clinics, but in today's cyber-connected world, you can't afford to miss what patients are saying about your practice online. When it comes to medical practice or even physician online reputation management, there are ten main review sites you should be monitoring and using to collect reviews from patients. It's clear that online review sites are here to stay. Consumers have widely been using them to make decisions on where to dine or where to book a hotel, and it is just a matter of time until patients begin using them as commonplace for selecting a healthcare provider. We understand this can be overwhelming, especially if you haven't even considered the online reviews that might be out there rating your services or your practice. It can be scary and stressful. In fact, seventy-eight percent of providers say that posting narrative comments online would increase physician job stress, according to a recent study published in the Journal of General Internal Medicine. Being proactive can assist in managing some of the stress that comes along with narrative comments left online. Just be sure to recognize that monitoring reviews is one thing but replying is another. We recommend checking with legal counsel regarding policies surrounding online review sites before posting a response to a review. There are many other pieces to consider such as HIPAA Compliance and organizational processes that may already be in place for posting a response to an online review. Some larger practices or healthcare organizations might even outsource the online reputation management for clinicians, so it's best to leave this up to the professionals if this is the case. If you're looking for advice on how to reply to negative patient reviews, subscribe to our blog. We'll be publishing more content on this subject matter in the near future. For now, here are the top 10 sites you can start monitoring today for online patient reviews. What it is: Yelp was founded in 2004 to help people find great local businesses. Since then, it has evolved into a review site that gathers millions of reviews on a variety of services and businesses including diners, dentists, home services, and more. Yelp recommends the most helpful and reliable reviews to the Yelp community based on an algorithm that measures various aspects of the review. While Yelp may be traditionally thought of as the site to visit when dining out, there are reviews on Yelp for physicians and physician practices. Considering the large number of Yelp users, we may see more and more consumers turn to Yelp for reviews on healthcare services. How to get started: To get started with your Yelp page, you'll need to go online to Yelp.com and login or sign up. Once you're logged in, you can search for your name or your practice name and claim the page as your business. Yelp will send you email updates for your page's activity and lets you know anytime someone leaves a review or asks a question to the community on your page. How you're rated: On Yelp, the user will leave a review from 1-5 stars and has the option to provide more details in a free text box. What it is: Google My Business is free and easy to use so practices can manage their online presence across Google. Google My Business encompasses Google search, Google+, and Google Maps. Google My Business makes collecting reviews super easy but first, you'll need to verify your business. How to get started: To get started with Google My Business, you'll need to visit https://www.google.com/business/ and click “Get on Google”. Select or create the Google account you want to use and sign in. Search for your business in the prompted area by name and address. Learn more about how to get started with Google My Business here. How you're rated: Users can leave a review of 1-5 stars and leave a description of their experience. Google My Business also lets users add photos of your business. The reviews will appear anytime your business is found through a Google search. 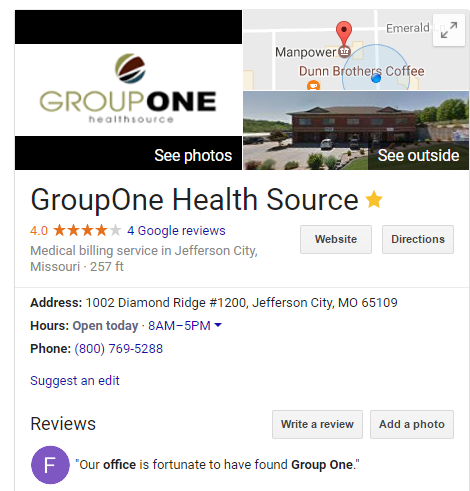 Below is an example of how GroupOne Health Source reviews appear when you search Google for "GroupOne Health Source." This section appears to the right of the search results and displays our star rating along with information from our Google My Business account. What it is: Facebook for business helps you stay connected to your audience by sharing videos, photos, and status updates. With 1.31 billion active accounts currently on Facebook, your practice needs to have a presence on this social media network. How to get started: To get started with a Facebook business page, you'll first need to create a personal profile page. After creating your Facebook page, you can click the drop-down arrow in the upper right-hand corner and create a page. Click on "local business or place" and continue to follow the steps through until your Facebook business page is up and running. Once your page is built, you're ready to start collecting reviews from other Facebook users. Reviews for your business on Facebook appear in the left column under "reviews." These reviews will be tied back to the Facebook profile of the user that leaves the review so things can get sticky here. Knowing what a particular patient says about you online can sometimes help or harm the physician-patient relationship. We'll cover more on how to handle negative reviews towards the end of this article. How you're rated: On Facebook, users can leave a review of 1-5 stars and post a free text message about their experience. To reply to a review, you can "like" or comment on the review in Facebook. What it is: WebMD is an online publication providing valuable health information and health management tools to subscribers. WebMD also hosts a physician directory to help visitors find a provider by name, specialty, condition, procedure, and location. Practitioners are then displayed in alphabetical order and on a map based on their location in your selected area. This list view allows you to see the physician's years of experience and rating from WebMD. How to get started: To get started, you'll need to claim your profile. Visit the WebMD physician directory, find your profile, and click on the image icon to "enhance your profile." From there, you'll be asked to login or create an account. You can customize your profile once it is created and start collecting reviews to help patients find you on WebMD. What it is: With more than 30 million people a month visiting Healthgrades, having an accurate and updated profile on this site is crucial. Healthgrades provides information about physicians, hospitals, and health care providers in a truly user-friendly experience. When searching on Healthgrades, patients can narrow in on the results by insurance, distance, review/rating, gender, age, and even availability. How to get started: Update your profile information on Healthgrades by clicking here. A provider can update their own information, or someone who works on behalf of the provider can also do this. How you're rated: A provider's Healthgrades rating is based on a 1-5 star scale and gives users the option to write a free text review as to the likelihood of recommending the provider to family and friends. What it is: RateMDs has been featured on USA Today, CNN, and MSNBC and it's no wonder why considering their 2.6 million+ doctor reviews. RateMDs makes it easy to find a doctor by specialty or search their database of over 2 million ratings and reviews to find the right physician. How to get started: Visit the RateMDs website, and on the homepage, you'll see in the top right corner a green button to "claim doctor profile." To get started, you'll want to claim your profile and then update all of the necessary information on your profile. Be sure to add a photo to your profile to increase engagement. How you're rated: Rating a physician on RateMDs is quick and easy. Physicians can be rated overall with a rating of 1-5 stars. The rating is also broken down into four categories so patients can rate staff, helpfulness, punctuality, and knowledge separately. There is also a comment box so patients can leave a detailed comment on their provider. What it is: Vitals helps patients find better care by browsing providers by name, specialty, condition, or location. Vitals touts a mission to empower people to shop for health care like an expert, no matter where they are or what their health care needs are. How to get started: To claim and update your Vitals profile, search the database for your profile. Once you click on your profile name, a box will appear to the right of the screen asking if this is you. Click on the update your information here and continue to follow the prompts to input your information such as business name, address, email, etc. You can also click here to claim your Vitals profile. What it is: ZocDoc whether online or on the go with the mobile app makes finding a nearby doctor in network easy. ZocDoc lets patients browse reviews and book appointments online. How to get started: Listing your practice with ZocDoc helps you build patient loyalty and attract new patients to your practice. Click here to get started with setting up your profile on ZocDoc today and start collecting patient reviews and filling appointment slots. How you're rated: Reviews on ZocDoc let patients rate providers overall but also specifically on bedside manner and wait time. There is also a spot for the patient to provide a brief description of their experience and all reviews are verified by ZocDoc. Providers listed on ZocDoc can also achieve awards such as rapid registration (allowing patients to complete forms online prior to the visit) and speedy response which means the practice confirms appointments booked online quickly. What it is: CareDash has made it their mission to make doctor and hospital information more accessible, inclusive, and transparent. CareDash is another doctor ratings and reviews website you need to have on your radar. While being a fairly new review website, they are growing fast and even offer health and wellness articles to attract patients to the site to leave reviews. How to get started: Visit CareDash.com and, on the home page you'll see where you can sign up and update your profile. How you're rated: Doctors on CareDash are rated with 1-5 stars overall. The review then requires a title and asks the patient to explain why the above rating was chosen. CareDash also provides review writing tips such as "give details" and "no identifying information" to help patients leave a constructive review. What it is: Angie's List was founded in 1995 and since then has grown to have a user base of over 3 million members that have provided 10 million reviews. While Angie's List may initially be known for reviews on household services, the reviews for healthcare are growing. In fact, health is one of four main navigational tabs on the website alongside house, yard, and more. Having health appear on the homepage upon login will encourage even more members of Angie's List to leave reviews on their providers and the practices that employ them. How to get started: Setting up your profile on Angie's List is pretty straightforward. You'll need to sign up using an email address and setting a password. After that, you will select a plan. You can use a free plan, or you can opt for more features with a silver or gold plan ranging from $25-$100 a year. Some categories will offer "N/A" to be fair, and there are two fields that let reviewers describe the work or services they needed and how it went. Cost is also optional so patients can provide approximate cost of the services performed and the date of the service. The increase in high-deductible health plans means more patients are paying for healthcare out of their pocket and are more conscious of the value they receive for what they pay. Healthcare has shifted into a more consumer-driven space and will continue to do so over the coming years as eligible clinicians under the Merit-based Incentive Payment System have their performance scores published on the CMS Physician Compare website. This website will allow consumers to browse and consider this information when selecting a healthcare provider. CMS will publish each eligible clinician's annual final score and the scores for each MIPS performance category within 12 months after the end of the relevant performance year. With 2017 being a MIPS performance year, eligible clinicians can expect to see their score published on the Physician Compare website over the course of 2018. But this is just one resource for patients to use when seeking online reviews. There are hundreds of avenues a patient might take to research your services on things like bedside manner, ease of booking an appointment, friendly staff, waiting room times, and so on. While there are hundreds of places this data may live online, it's most important that you start small by focusing on the top 10 review sites that display doctor reviews and ratings. Start monitoring these sites today and make sure you claim your profile! 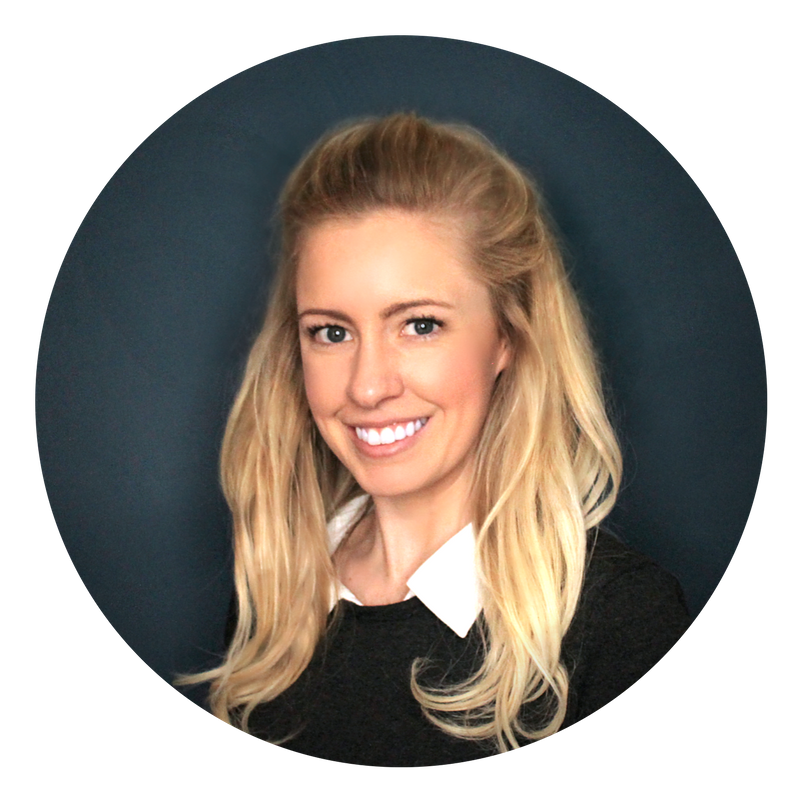 Having your profile set up with accurate location and services information as well as a profile picture can assist in attracting new patients to your practice.